The Cowboys moved to 13-0 after dominating Air Force. STILLWATER — Air Force entered Friday’s dual without a ranked wrestler, and the Cowboys used a ranked wrestler in all but three weights. That led Oklahoma State to a dominant 39-0 victory. The win made the Cowboys 13-0 on the season and was their second shutout of the year. It had been months since OSU fans got to see Chandler Rogers and Preston Weigel. 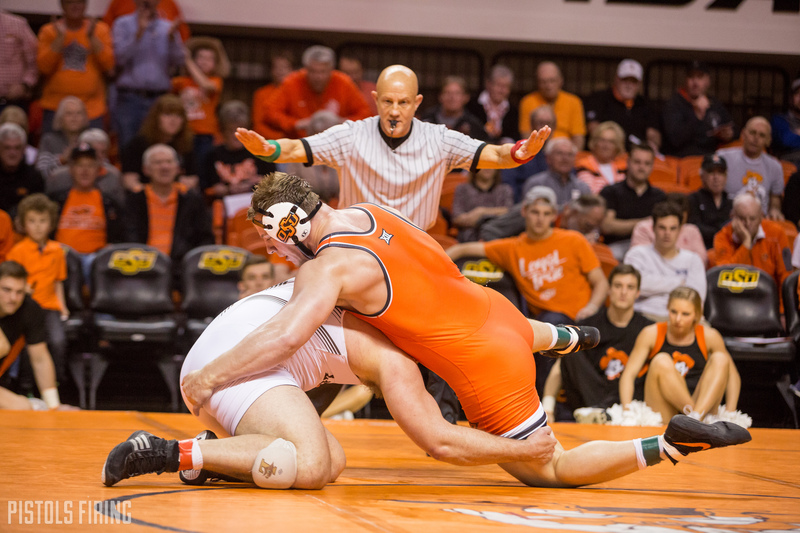 The duo of redshirt seniors had been sidelined with injuries, both dating to mid-December, but both returned to the mat in front of a GIA crowd Friday night. Rogers’ 165-pound match started the night, as he clashed with Jacoby Ward. It was a bit of a slow start from the two-time All-American as the matched entered the third period tied at 3. Ward got an escape in the final minute to go up 4-3, but Rogers promptly took him down and picked up another point off riding time. Weigel matched up with Anthony McLaughlin, who entered with a solid 10-1 record. After a scoreless first, Weigel picked up an escape in the second and rode McLaughlin the entire third to win 2-0. It was nice moment at 174 for Stillwater High product Christian Bahl. Bahl, a redshirt freshman, made his dual debut in front of his hometown in what would be one of the more competitive matches of the night. Bahl scored a big takedown in the final minute of the first period that propelled him to a 4-3 win. It was a rough night for Air Force’s heavyweight freshman Kayne Hutchinson. Derek White, a redshirt senior, scored nine takedowns on his counterpart before throwing Hutchinson in a cradle in the third period and scoring the only fall of the night. Before the pin, White scored 19 points. Despite the dominant performance, Smith said he wants to see his heavyweight be a little more offensive. “I just wish he’d go and force the action a little more,” Smith said. “He had a lot of runarounds and defensive scores today, which counts the same as offense, but for him to prepare himself to beat better guys, it’s gonna be his shots. It’s gonna be him getting to the legs. It’s gonna be him putting points on the board from an offensive standpoint. The Cowboys have a week off before hitting the road to face Missouri on Feb. 16.